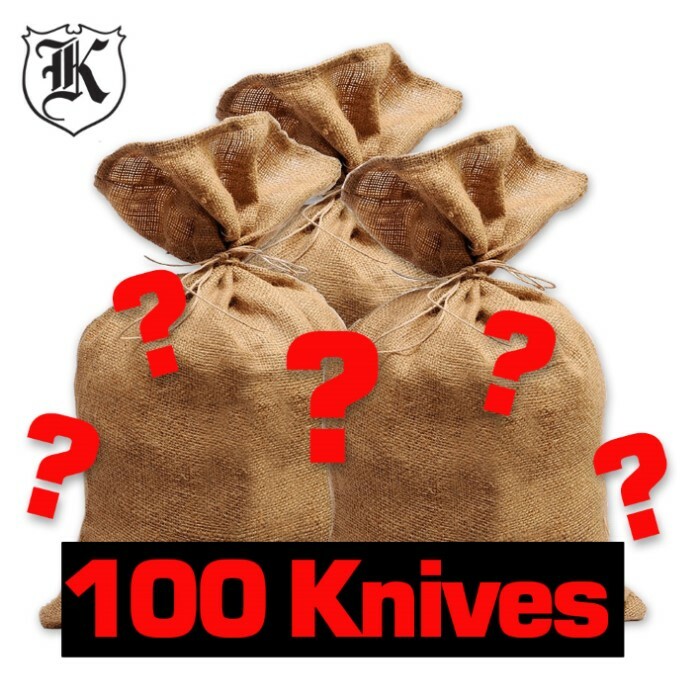 100 Throwing Knives Surprise Bag | BUDK.com - Knives & Swords At The Lowest Prices! This is our craziest surprise bag ever! You will receive more than 100 throwing knives for only $99.99. That's less than $1 per knife! For those of you who really want to learn to throw knives, this is the surprise bag for you! I am very disappointed with this purchase. I wouldn't recommend this surprise bag to anyone let alone a friend. It clearly states in the product description that "They will be a varying mix of colors, styles and sizes, but all of these knives will be throwing knives!" I received 4 sets of throwing knives with 24 in each box and 1 set of 6 throwing knives. The only thing that was different in this surprise bag was the 1 set of 6 throwing knives. The other sets of throwing knives were exactly the same except for the color, and All of the knives were the same size. I dont feel like they were holding up to there end of the deal. I mean I wasnt expecting top notch notch knives, but I was expecting different sizes of knives and more of a variation of knives as well. I was expecting, like many others, a large amount of random knives. I was actually quite pleased to find many of the knives were the same. This will make my prepping easier in the sense that I can plan out a sheath design for wear without every knife having to have a different size. The overall value is probably around $150.00. While some don't like Kunai I think if you know how to use them they are just as effective as others. I already have plenty of knives and larger throwing knives. The small knives make them easier to conceal and within legal parameters to carry on a daily basis. Thanks BudK this works out great for me. They are designed for distraction not death! I did receive over 100 knives; 102 actually. I was originally expecting many different knives. Then I read other reviews an my expectations changed to closer to what actually received. I got 2 boxes of RR540, 1 box of BK1994, 1 box of RR539, and an RR533. I was hoping this would be a great value to practice on many different knives than what I currently have. I did get a few different knives but large quantities of each. It's a good deal, but make sure to correctly adjust your expectations. Wow! These knives were just great, I was definitley not expecting these knives to be high quality. Thanks so much BudK! I was one of the first to purchase this, and there was initially an error that caused them to send too few knives, but Budk was quick o fix the situation and I actually ended up with more than 100 knives. The knives themselves are nice,I found most of them to be very well balanced, which is good when throwing.some of the knives i received are pretty cool looking, which is an added bonus. Of course, the knives you receive will probably be different than what i received, but that's part of the fun of a surprise bag isn't it? Know going into it that this is not necessarily a beginner's kit, it isn't intended to be. If you're looking for a target or a throwing guide, you can easily find those elsewhere on the site. What you will receive is 100 (or more) throwing knives that can provide you with hours of fun honing your throwing skills. As an added bonus, with so many knives, it isn't the end of the world if you break or lose one. Thanks Budk, you rock! When I ordered this I was NOT expecting 100 high quality throwing knives. I was expecting 100 completely random unpackaged throwing knives that were leftovers or surplus, mostly small and cheap but at least a few decent ones. However what I received was 100(4 sets of 24 and 1 set of 6) miniscule 6 inchers, 72 of which were "kunai" and 2 of those sets were identical. The description clearly states "They will be a varying mix of colors, styles and SIZES," while they were in fact different colors and styles they were all the same size. Also the description clearly states that this is an ideal package "For those of you who really want to learn to throw knives," However small knives are very difficult to control which makes them very bad for beginners. Not to mention that "quantities are limited" doesn't make sense when they clearly just grabbed some cheap random stock. I had to give 2 stars (fair) because everything else is per the description and the term "random" does leave a lot of room. However I feel that potential buyers should know exactly what they are getting into. O, and if I bought everything separately from budk I would pay $130. Bottom Line: I'd stay away from this and get a few of the good sets that budk has. What started as a drunken internet purchase has become one of my best decisions. Budk sticks true to their words when they say "less than $1 a knife" in my package, over half of the knives are of the same geometry and weight, making muscle memory easy to learn. One thing though is that my order had to come in two different packages. May have been a processing plant error or issue with boxing. But none the less, I'll be getting the rest of my 100+ knives. No tree or cardboard box is safe from my fury. Just Wow, so many knives a few hundred dollars worth.Never thought I'd be so suprised to get it.